Description: Stout rhizomatous perennial to 2.5 m high; culms to 12 mm diam., hollow, ribbed, glabrous, sometimes glands in a ring below node. Leaves with sheath closed, ribbed, glabrous; ligule membranous, 4–7 mm long, apiculate; blade flat, to 16 mm wide, subulate, ribbed, midrib prominent, scabrous. Inflorescence open, 25–30 cm long, to 15 cm wide. 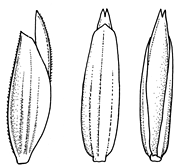 Spikelets to 1 cm long, 4–9 florets; pedicels to 15 mm long, ribbed, glabrous, sometimes scabrous. Glumes obtuse, membranous, 1-nerved; lower c. 2 mm long, upper c. 3 mm long. Lemmas 2–3 mm long, obtuse, overlapping, 7-nerved, keeled, keel scabrous. Palea marginally longer than lemma, 2-keeled, keels scabrous. Distribution and occurrence: Planted in swampy areas as a fodder crop but has become a significant weed of wetlands. Native of Eur.